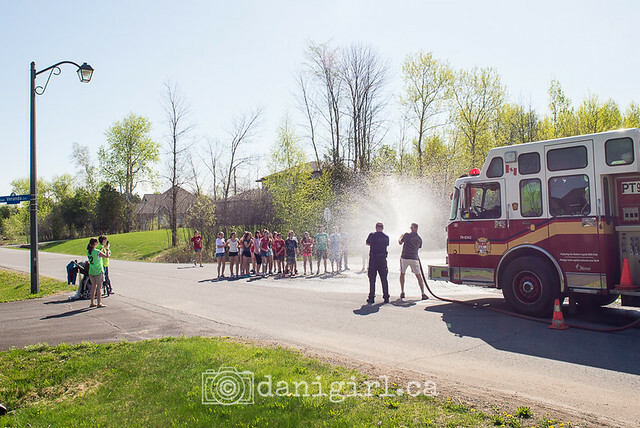 I had the great pleasure of being the official parent council photographer for the school walkathon yesterday. Could you imagine a more perfect day for it? We’re new to the school, but apparently the 5 km walkathon is a 15 year tradition. The kids had a blast – a very wet blast, in fact. It’s always a good time when one of the teachers moonlights as a volunteer firefighter! Funny aside: we were meeting with the volunteer route marshals in the morning when someone mentioned that a construction company had unexpectedly laid fresh new sidewalks that very morning on the walkathon route. One thousand teenagers and freshly poured concrete? What could POSSIBLY go wrong? This was my first major event with a school that will probably be a part of our lives for more than a decade, and I came away with a huge smile on my face. That’s a good day!